Explain: What does a good mentor “do”? Nobody is a great teacher during his or her first year. Sounds harsh, but it’s true. Some people are acceptable teachers. Some are even good teachers. But during your first year, there’s just too much that you don’t know. And that’s okay, because you’ll learn. If you have a good mentor, the strides you make during that first year can be monumental. 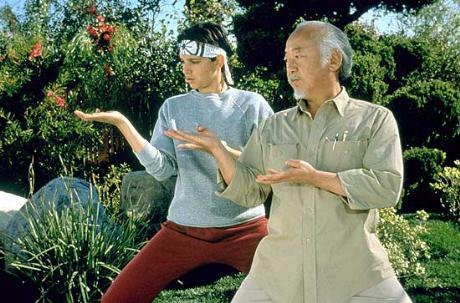 Daniel LaRusso knows how important a good mentor can be. Most school districts require first-year teachers to be assigned a mentor teacher, and those mentor teachers are expected to meet a specific number of times (usually once a month) with their protege. Depending on the quality of the mentor, these meetings can be life-savers or complete wastes of time. Teacher mentors are in a unique position. It seems more beneficial to be mentored by someone teaching the same grade as you. However, in elementary schools, most grade levels have the same planning times, lunch times, and recess times. This means that unless the principal makes a deliberate effort to make it happen, a mentor doesn’t have an opportunity to observe and offer suggestions and advice. Still, one of the most important responsibilities of a mentor is to observe. (It’s even recommended that veteran teachers record themselves periodically, to ensure that they’re not slipping into bad habits.) Being observed is a practice that reveals not only flaws, but also what a teacher does well. A good mentor will help his or her protege become aware of bad habits and develop good practices more purposefully. A mentor must be chosen wisely, because he or she should be able to model a strong, positive relationship between him or herself and the students in the classroom. The most important thing that that teachers must provide is a safe, welcoming space for students, and a strong relationship is at its core. A good mentor should encourage growth. Although the basics of what we teach doesn’t change much, our methods can and should. It does our students a disservice when their teachers refuse to be open to new ideas. What message does it send to students when their teachers refuse to learn?